Model shown in picture show the kensinton in optional extra log lap. Fully glazed Georgian double doors with antique hinges, ornate handle and lever lock. 2 Georgian front windows 10ft or 12ft gable has 9 pane openers. 8ft gable has two 6 pane openers. 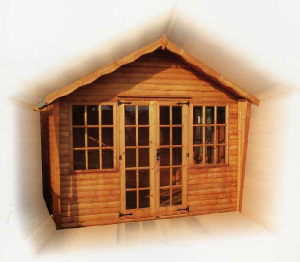 * On a 12ft gable framing sizes wil be 44mm x 44mm for extra suport.